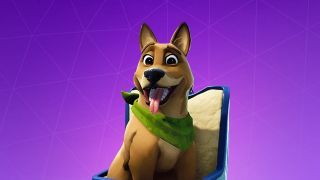 Fortnite update 8.40 is here and it lets you pet dogs. It's the most eagerly awaited bit of common courtesy to hit the game since Epic added the option to thank the bus driver, and it's finally here. The update also gives planes a second chance to shine in their own safely contained mode, while also making some welcome changes to the Battle Pass Friend XP Bonus. We've laid out how those three tweaks will change how you play the game right here, and you can scroll on to see the full Fortnite patch notes from the developers. Finally, the good pets of Fortnite can get their just reward for sticking by us through explosive eliminations and extended bush campouts alike. Finding out how to pet the dog in Fortnite is easy, just walk up to a teammate who has a pet equipped and press the button prompt when it appears - this works in both the lobby and actual matches. Note that you, heartbreakingly, cannot pet your own pet. Since you carry them around on your back all the time I guess the ergonomics just don't work out. Fate can be so cruel. The love-em-or-hate-em X-4 Stormwing planes are back in their own Limited-Time Mode: welcome to Fortnite Air Royale. The duos-only mode gives every team their own plane with three lives and keeps the fight in the sky by immediately eliminating players who set foot on the ground (planes can land momentarily, but they'll be destroyed if they linger). It goes all Sky Mario Kart with floating chests that give you items just for flying through them, and you can even rack up extra lives for your duo by hijacking an enemy plane. Stay frosty up there. Used to be you had to coordinate a full play date for an entire squad of friends to get the maximum Battle Pass Friend XP Bonus of 120%, which was really frickin' hard for anybody who doesn't always squad up with the same full group every night. Now you'll get that same 120% boost whether you're playing with one Battle Pass owning friend or a whole squad of them. The casuals of the world thank you, Epic Games. Read on for the full update 8.40 change log below.